1 A None No Power Seat 1 A is a standard Business Class seat that provides additional privacy from the cabin, however, the proximity to the lavatory and galley may be bothersome. 1 K None No Power Seat 1 K is a standard Business Class seat that provides additional privacy from the cabin, however, the proximity to the lavatory and galley may be bothersome. 10 A None No Power Seat 10 A is a standard Business Class seat whose proximity to the lavatories and galley may be bothersome. 10 E None No Power Seat 10 E is a standard Business Class seat, however, the proximity to the lavatories and galleys, and position of the bassinet may be bothersome. 10 F None No Power Seat 10 F is a standard Business Class seat, however, the proximity to the lavatories and galleys, and position of the bassinet may be bothersome. 10 K None No Power Seat 10 K is a standard Business Class seat whose proximity to the lavatories and galley may be bothersome. 11 A None No Power Seat 11 A is a standard Business Class seat that provides additional privacy from the cabin. 12 K None No Power Seat 12 K is a standard Business Class seat that provides additional privacy from the cabin. 2 E None No Power Seat 2 E is a standard Business Class seat, however, the proximity to the lavatory and galley, and position of the bassinet may be bothersome. 2 F None No Power Seat 2 F is a standard Business Class seat, however, the proximity to the lavatory and galley, and position of the bassinet may be bothersome. 20 A None No Power Seat 20 A is a standard Premium Economy Class seat with additional legroom, however, the position of the bassinet may be bothersome. There is no floor storage for this seat during takeoff and landing. The tray table and video monitor are in the armrest, making the armrest immovable and slightly reducing seat width. 20 B None No Power Seat 20 B is a standard Premium Economy Class seat with additional legroom, however, the position of the bassinet may be bothersome. There is no floor storage for this seat during takeoff and landing. The tray table and video monitor are in the armrest, making the armrest immovable and slightly reducing seat width. 20 D None No Power Seat 20 D is a standard Premium Economy Class seat with additional legroom. There is no floor storage for this seat during takeoff and landing. The tray table and video monitor are in the armrest, making the armrest immovable and slightly reducing seat width. 20 E None No Power Seat 20 E is a standard Premium Economy Class seat with additional legroom. There is no floor storage for this seat during takeoff and landing. The tray table and video monitor are in the armrest, making the armrest immovable and slightly reducing seat width. 20 F None No Power Seat 20 F is a standard Premium Economy Class seat with additional legroom. There is no floor storage for this seat during takeoff and landing. The tray table and video monitor are in the armrest, making the armrest immovable and slightly reducing seat width. 20 J None No Power Seat 20 J is a standard Premium Economy Class seat with additional legroom, however, the position of the bassinet may be bothersome. There is no floor storage for this seat during takeoff and landing. The tray table and video monitor are in the armrest, making the armrest immovable and slightly reducing seat width. 20 K None No Power Seat 20 K is a standard Premium Economy Class seat with additional legroom, however, the position of the bassinet may be bothersome. There is no floor storage for this seat during takeoff and landing. The tray table and video monitor are in the armrest, making the armrest immovable and slightly reducing seat width. 21 B None No Power Seat 21 B is a standard Premium Economy Class seat. 21 D None No Power Seat 21 D is a standard Premium Economy Class seat. 21 E None No Power Seat 21 E is a standard Premium Economy Class seat. 21 F None No Power Seat 21 F is a standard Premium Economy Class seat. 21 J None No Power Seat 21 J is a standard Premium Economy Class seat. 22 B None No Power Seat 22 B is a standard Premium Economy Class seat. 22 J None No Power Seat 22 J is a standard Premium Economy Class seat. 23 B None No Power Seat 23 B is a standard Premium Economy Class seat. 23 J None No Power Seat 23 J is a standard Premium Economy Class seat. 3 A None No Power Seat 3 A is a standard Business Class seat that provides additional privacy from the cabin. 3 K None No Power Seat 3 K is a standard Business Class seat that provides additional privacy from the cabin. 40 A None No Power Seat 40 A is a standard Economy Class seat with additional legroom, however, the position of the bassinet may be bothersome. There is no floor storage for this seat during takeoff and landing. The tray table and video monitor are in the armrest, making the armrest immovable and slightly reducing seat width. 40 B None No Power Seat 40 B is a standard Economy Class seat with additional legroom, however, the position of the bassinet may be bothersome. There is no floor storage for this seat during takeoff and landing. The tray table and video monitor are in the armrest, making the armrest immovable and slightly reducing seat width. 40 C None No Power Seat 40 C is a standard Economy Class seat with additional legroom, however, the position of the bassinet may be bothersome. There is no floor storage for this seat during takeoff and landing. The tray table and video monitor are in the armrest, making the armrest immovable and slightly reducing seat width. 40 D None No Power Seat 40 D is a standard Economy Class seat with additional legroom. There is no floor storage for this seat during takeoff and landing. The tray table and video monitor are in the armrest, making the armrest immovable and slightly reducing seat width. 40 E None No Power Seat 40 E is a standard Economy Class seat with additional legroom. There is no floor storage for this seat during takeoff and landing. The tray table and video monitor are in the armrest, making the armrest immovable and slightly reducing seat width. 40 F None No Power Seat 40 F is a standard Economy Class seat with additional legroom. There is no floor storage for this seat during takeoff and landing. The tray table and video monitor are in the armrest, making the armrest immovable and slightly reducing seat width. 40 H None No Power Seat 40 H is a standard Economy Class seat with additional legroom, however, the position of the bassinet may be bothersome. There is no floor storage for this seat during takeoff and landing. The tray table and video monitor are in the armrest, making the armrest immovable and slightly reducing seat width. 40 J None No Power Seat 40 J is a standard Economy Class seat with additional legroom, however, the position of the bassinet may be bothersome. There is no floor storage for this seat during takeoff and landing. The tray table and video monitor are in the armrest, making the armrest immovable and slightly reducing seat width. 40 K None No Power Seat 40 K is a standard Economy Class seat with additional legroom, however, the position of the bassinet may be bothersome. There is no floor storage for this seat during takeoff and landing. The tray table and video monitor are in the armrest, making the armrest immovable and slightly reducing seat width. 43 C None No Power Seat 43 C is a standard Economy Class seat whose proximity to the lavatories may be bothersome. 43 D None No Power Seat 43 D is a standard Economy Class seat with limited recline. The proximity to the lavatories may be bothersome. 43 E None No Power Seat 43 E is a standard Economy Class seat with limited recline. The proximity to the lavatories may be bothersome. 43 F None No Power Seat 43 F is a standard Economy Class seat with limited recline. The proximity to the lavatories may be bothersome. 43 H None No Power Seat 43 H is a standard Economy Class seat whose proximity to the lavatories may be bothersome. 44 A None No Power Seat 44 A is a standard Economy Class seat that is missing a window. 44 H None No Power Seat 44 H is a standard Economy Class seat whose proximity to the lavatories may be bothersome. 44 K None No Power Seat 44 K is a standard Economy Class seat that is missing a window. 46 A None No Power Seat 46 A is a standard Economy Class seat with additional legroom, however, the Exit Door protrusion and the proximity to the lavatories may be bothersome. There is no floor storage for this seat during takeoff and landing. The tray table and video monitor are in the armrest, making the armrest immovable and slightly reducing seat width. 46 B None No Power Seat 46 B is a standard Economy Class seat with additional legroom, however, the proximity to the lavatories may be bothersome. There is no floor storage for this seat during takeoff and landing. The tray table and video monitor are in the armrest, making the armrest immovable and slightly reducing seat width. 46 C None No Power Seat 46 C is a standard Economy Class seat with additional legroom, however, the proximity to the lavatories may be bothersome. There is no floor storage for this seat during takeoff and landing. The tray table and video monitor are in the armrest, making the armrest immovable and slightly reducing seat width. 46 D None No Power Seat 46 D is a standard Economy Class seat with additional legroom, however, the proximity to the lavatories may be bothersome. Also, the position of the bassinet may be bothersome. There is no floor storage for this seat during takeoff and landing. The tray table and video monitor are in the armrest, making the armrest immovable and slightly reducing seat width. 46 E None No Power Seat 46 E is a standard Economy Class seat with additional legroom, however, the proximity to the lavatories may be bothersome. Also, the position of the bassinet may be bothersome. There is no floor storage for this seat during takeoff and landing. The tray table and video monitor are in the armrest, making the armrest immovable and slightly reducing seat width. 46 F None No Power Seat 46 F is a standard Economy Class seat with additional legroom, however, the proximity to the lavatories may be bothersome. Also, the position of the bassinet may be bothersome. There is no floor storage for this seat during takeoff and landing. The tray table and video monitor are in the armrest, making the armrest immovable and slightly reducing seat width. 46 H None No Power Seat 46 H is a standard Economy Class seat with additional legroom, however, the proximity to the lavatories may be bothersome. There is no floor storage for this seat during takeoff and landing. The tray table and video monitor are in the armrest, making the armrest immovable and slightly reducing seat width. 46 J None No Power Seat 46 J is a standard Economy Class seat with additional legroom, however, the proximity to the lavatories may be bothersome. There is no floor storage for this seat during takeoff and landing. The tray table and video monitor are in the armrest, making the armrest immovable and slightly reducing seat width. 46 K None No Power Seat 46 K is a standard Economy Class seat with additional legroom, however, the Exit Door protrusion and the proximity to the lavatories may be bothersome. There is no floor storage for this seat during takeoff and landing. The tray table and video monitor are in the armrest, making the armrest immovable and slightly reducing seat width. 5 A None No Power Seat 5 A is a standard Business Class seat that provides additional privacy from the cabin. 5 K None No Power Seat 5 K is a standard Business Class seat that provides additional privacy from the cabin. 57 A None No Power Seat 57 A is a standard Economy Class seat that is missing a window. 57 K None No Power Seat 57 K is a standard Economy Class seat that is missing a window. 58 C None No Power Seat 58 C is a standard Economy Class seat whose proximity to the lavatories and galleys may be bothersome. 58 D None No Power Seat 58 D is a standard Economy Class seat whose proximity to the lavatories and galleys may be bothersome. 58 F None No Power Seat 58 F is a standard Economy Class seat whose proximity to the lavatories and galleys may be bothersome. 58 H None No Power Seat 58 H is a standard Economy Class seat whose proximity to the lavatories and galleys may be bothersome. 59 A None No Power Seat 59 A is a standard Economy Class seat in the last row of this aircraft and has limited recline. The proximity to the lavatories and galley may be bothersome. 59 B None No Power Seat 59 B is a standard Economy Class seat in the last row of this aircraft and has limited recline. The proximity to the lavatories and galley may be bothersome. 59 D None No Power Seat 59 D is a standard Economy Class seat in the last row of this aircraft and has limited recline. The proximity to the lavatories and galley may be bothersome. 59 E None No Power Seat 59 E is a standard Economy Class seat in the last row of this aircraft and has limited recline. The proximity to the lavatories and galley may be bothersome. 59 F None No Power Seat 59 F is a standard Economy Class seat in the last row of this aircraft and has limited recline. The proximity to the lavatories and galley may be bothersome. 59 J None No Power Seat 59 J is a standard Economy Class seat in the last row of this aircraft and has limited recline. The proximity to the lavatories and galley may be bothersome. 59 K None No Power Seat 59 K is a standard Economy Class seat in the last row of this aircraft and has limited recline. The proximity to the lavatories and galley may be bothersome. 7 A None No Power Seat 7 A is a standard Business Class seat that provides additional privacy from the cabin. 7 K None No Power Seat 7 K is a standard Business Class seat that provides additional privacy from the cabin. 8 A None No Power Seat 8 A is a standard Business Class seat whose proximity to the galley may be bothersome. 8 E None No Power Seat 8 E is a standard Business Class seat whose proximity to the galley may be bothersome. 8 F None No Power Seat 8 F is a standard Business Class seat whose proximity to the galley may be bothersome. 8 K None No Power Seat 8 K is a standard Business Class seat whose proximity to the galley may be bothersome. Business and Premium Economy Class features in-seat regular AC power at every seat as well as USB ports. Economy Class features in-seat regular AC power outlets at every two per triple seat as well as USB ports. 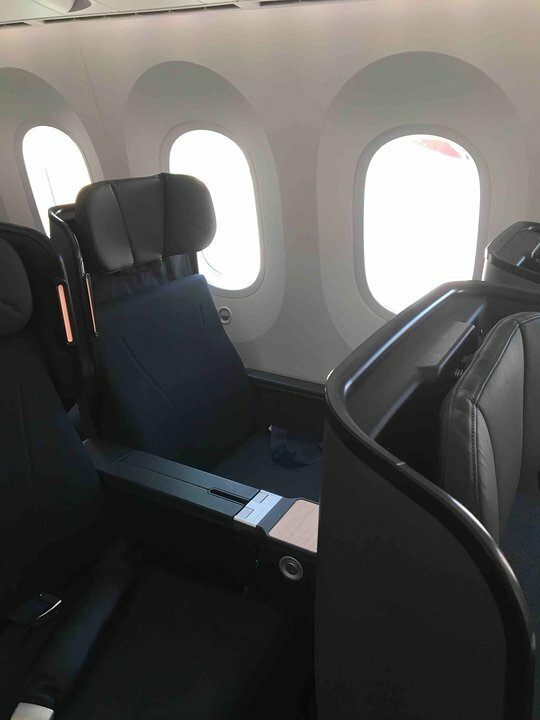 Qantas' newest aircraft, the Boeing 787-9 Dreamliner is outfitted with 236 seats. The interior features 42 lie flat Business Class seats, 28 Premium Economy seats, and 166 standard Economy seats. All the overhead bins in row 12 are locked for "medical equipment" which forces you to store above the heads of your fellow passengers in row 11. I sat in Isle Seat 40D from LAX to BNE on the QANTAS Boeing 787-9. Lucked out with a empty middle seat to my right and an arm rest that folded up out of the way. The seat was comfortable w/ample leg room and seat recline was okay. Of course no front seat to stow my backpack underneath. 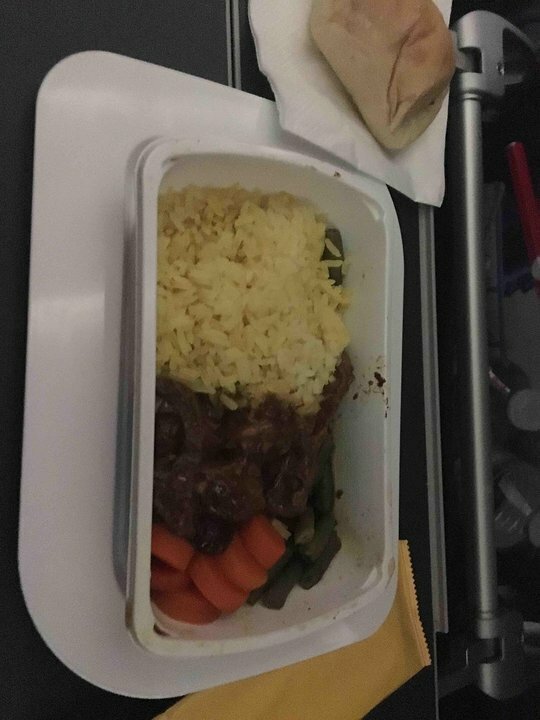 IFE was good and food was really good and armrest tray table was okay too. I would recommend this seat on a long 14 hour flight. My flight was from JFK to LAX on this aircraft. I found the seat narrow and quite hard, thankfully the LAX to SYD flight was on an A380 which was more comfortable. The lack of window on either side of row 57 was also disconcerting. If traveling on a Dreamliner again we will try to select row 59 even though it is close to the toilets. I am a Frequent Flyer and i generally sit in the front end of the plane. The pluses: it provides a stable flying experience and it is relatively quiet. I was surprised at how subjectively cramped this plane feels. The corridors are so narrow you cannot squeeze past and maybe it was psychological but the business seats seem to be cramped. I did a tour of premium economy and economy and they seemed to really cramped although they are presented as being slightly bigger than their counterparts in say the A330. I don't believe it. I like bigger planes, the old 747 and the newer A380 which are, no question, much more spacious. No way could you sit in this thing for 17 hours. I've abandoned that idea. I wonder if any of the marketing hot shots actually sit in these things! You can entertain yourself for half an hour by playing with the window. The guys across from me in the middle row (I think 2E) didn't have a place to store their luggage. Now that is really bad when you have paid 6 grand and you can't stow your luggage nearby! 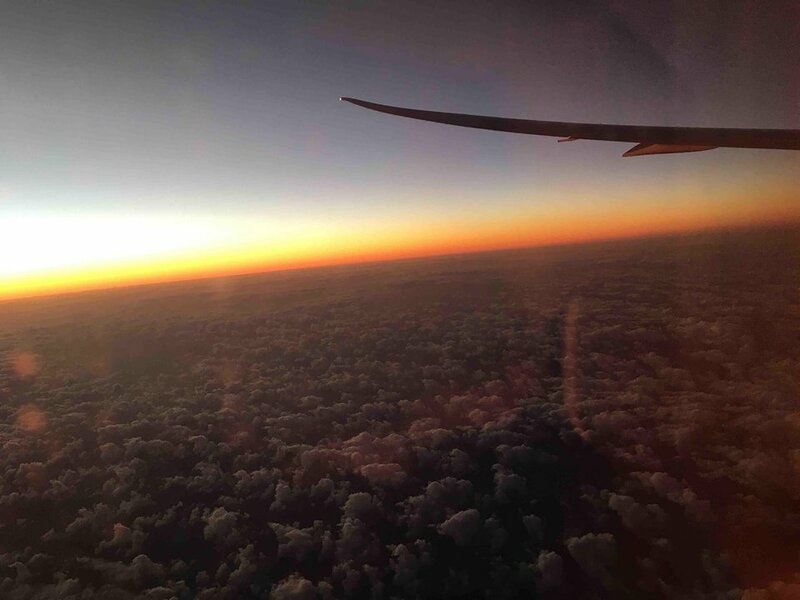 I'm a Qantas frequent flyer and chose this flight from Melbourne to Los Angeles more for the departure time than for the aircraft, as the late evening departure allowed me a full day in Melbourne on the last day of my holiday. This aircraft may be "dreamy" for business class passengers and perhaps for premium economy travelers, but for those of us in basic economy, it's a full-on nightmare. Thankfully, there was no one sitting in the middle seat. With no divider at the bottom of the seat, I and whoever might've been sitting next me would've been jostling for legroom the entirety of this 14-hour flight to the US. I'm just over 6 feet tall and slender and I was cramped the entire flight. Worse still, when my seat was upright and the passenger in front of me reclined, the back of his seat was practically meeting my chin, making it impossible to comfortably eat during meal times. I had to bother flight attendants to sort this out during meals. The tinted windows aren't as "special" as they're made to seem, but the in-flight entertainment system was good quality. Unless Qantas does some upgrading of its Dreamliner fleet interior to create more space, I'm not ever again flying this aircraft. 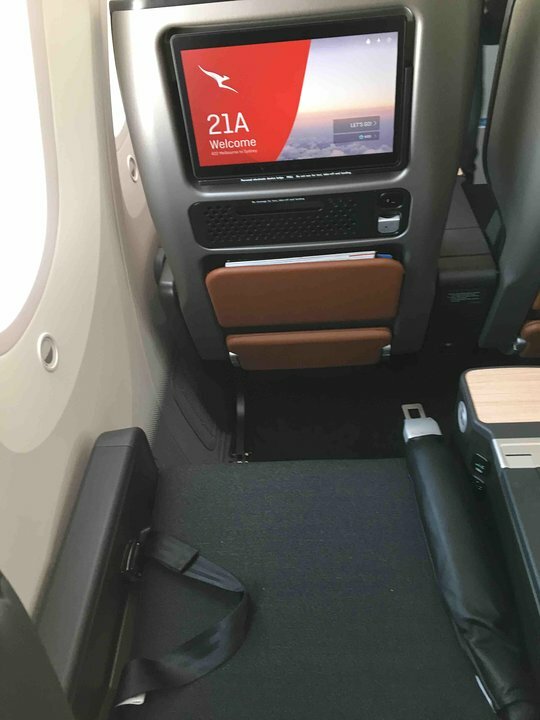 I now live in San Francisco and although Qantas now has non-stop flights to Melbourne, I'd rather fly to Los Angeles first, then hop on to Qantas's far more spacious A380s, on which I've made several journeys and been very comfortable. 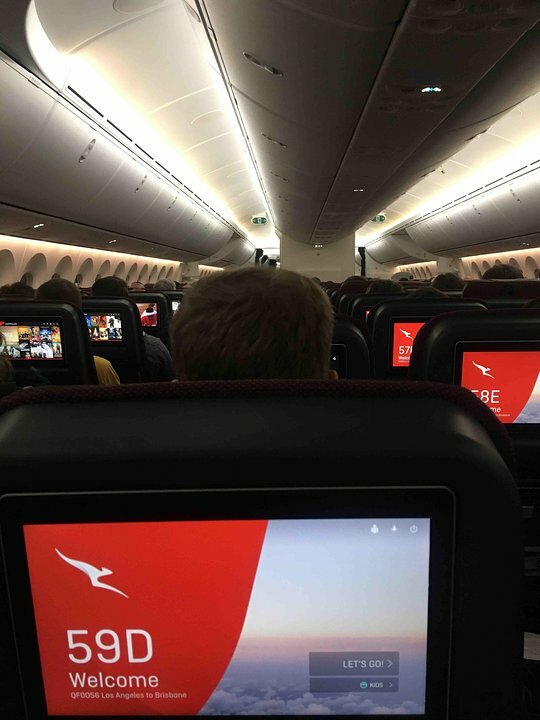 I flew on Qantas 787 from LAX to JFK. Was lucky enough to get an exit row seat in the main economy section. Fortunately both my row and the flight was below capacity, so I had an empty seat next to me. Even so, the slightly narrower seat felt a little cramped. For me the plus was the legroom. I'm not sure I would like to sit further back. And I will definitely not be flying to London via Perth for 17 hours on this aircraft. I flew from Melbourne to Perth 26 Sept 2018 and hated it. The jet was going on to London and I was glad I wasn't. Hadn't flown for about 25 years and I'm a lot older and heavier, and couldn't believe how cramped I felt. Worst thing is that when I go back to melbourne I'm going to have to fly again. No buses do that journey these and the train costs a fortune. I really screwed up. Should have stayed in Victoria. I used to enjoy flying. Now I hope my next flight is my last. In 1969 I flew to Singapore in a 707. Much better then than what you have to put up with these days flying economy. Might try Virgin instead of Qantas when I go back to Melbourne. LHR-PER. 17 hours in this claustrophobic interior in such a small seat is beyond the par. Seat 43D backs on to the lavatory wall and for 17 hours I was subjected to the loud SWOOSH sound every time the toilet was flushed and that's a lot of times on a full aircraft. I was glad to get on the more spacious AIRBUS330 for the domestic sector home PER-SYD. At 17 inches the seats are simply not wide enough for an average-sized adult to sit comfortably for 17 hours LHR-PER. A tall but not large passenger sitting next to someone who was also not oversized could not sit flat against the seat back side by side as their shoulders wanted to fill the same space. He spent the entire flight sitting at a slight angle to not bet leaning into the aisle. Speaking of the aisle, he was bumped continuously during the flight, even though he was within the confines of my seat. Qantas, like some other airlines, has put 9 seats across in a body originally designed for 8 across. This row of seats does NOT have additional leg room. A normal sized person CANNOT stretch their legs out to full length. Additionally, the holder for inflight magazines is at floor level on the bulkhead and further restricts leg room. I have done 3 flights on the LHR-PER direct route. The premium economy seats are uncomfortably hard. There are no window shades and the windows do not dim properly. On QF10 do NOT sit on the left hand side of the aircraft as you will have "full moon" effect light from the sun coming through your window for at least 5 hours of your flight. This aircraft has been designed for the airlines and not for passenger comfort. Flew LAX to BNE on 9/10/18. Excellent seat. Great space and amenities and terrific service. Had just finished MSY to LAX on an AA flight which was fine but the Qantas service on QF16 made me proud to be an Aussie. Well done, Qantas. Aisle sear front row of economy. Bothereome with trolleys going past. TV controls on inside rigt of seat handle. Not able to move control panel. Every tike i moved, i managed to pish one of the buttons. Either changed the volune, channel, put on the light or called the hosty. Very annoying. Based on SeatGuru recommendation I chose 3K and could not have been better. The large screen, armrest off-set from the aisle, comfortable, and private winged design seating was comparable to QF first class on the Airbus. This confirguration and aircraft has distinguished itself as a better long-haul product than the A380. JFK to LAX was my first and hopefully last flight on a Dreamliner. Seats 57H, J and K do not have a window, which is bad but worse is the lack of room and comfort of the seat. The A380 leg in seats 57H and J of QF12 LAX/SYD felt like premium economy compared to the Dreamliner. I would hate to travel from PER to LHR in Dreamliner economy. Give us the 747 or 380 anytime over this aircraft. The legroom is very good, food was amazing, and I had a charming crew. But the 3-3-3 Configuration is a problem, the seats are very narrow. I also wish they had added remote controls because I'm not exactly a person to bend over in order to touch the screen. I travelled from LA to Brisbane in this seat in business class and felt like I was in Central station at peak time the entire flight. With the galley in front of me the to and fro of the attendants to premium economy behind me was unrelenting and the constant banging of closet doors and such in the galley was loud even with the noise cancelling headphones and the ear plugs!!! I found the entire flight very agitating a complete waste of money and I will not travel business class on this aircraft EVER again. A 17.2 inch wide seat on a 17-hour long flight is diabological! Paid extra legroom for 46 H &J. This was terrible. No shelf to put anything like a book or phone etc. People stepping all over outstretched legs while queuing for the toilet etc. Would not recommend to anybody. Premium economy is disappointing and not as good as the A380. In fact we felt A380 exit row economy is more comfortable - and far cheaper. The aisle arm rest on my seat kept collapsing if I put any weight on it. Apparently, it is meant to go down if you press it in the right place (wherever that is) but mine would collapse if I leant on it. The seat belt with it's big lump is the worst I have ever come across - gets in the way of the tray table and is uncomfortable when trying to sleep. the seat is not particularly comfortable - I have slept more on A380 PE. Overall, PE is not worth it and the plane is not designed for passengers only for long haul efficiency. Terrible aircraft. Premium economy is a waste of money. Windows do not black out so flying LHR-PER you spend hours with a muted sun pouring light in through the window. The seat belt with its lump is terribly uncomfortable especially when trying to sleep and it must be loosened to fit under the tray table when table is in use. Seats are not very comfortable. Foot rest is good. Minimal seat stowage. Good overhead stowage. Plane designed for airlines not passengers. Back to the A380 for us. Missing a window does not mean there is no window, it means there is one instead of two! The odd numbered seats do provide additional privacy and I enjoy having one ambient light window since I sleep during most of the long haul anyway. Good distance from front and rear lavatories. Green seat in my opinion. This seat was great, had great legroom with a really comfortable net leg rest. The IFE was huge and responsive and the food and crew were great. under the screen was a compartment to store and charge a phone which was a very nice touch. this is my new plane of choice and would recommend. It could use with one more bathroom though but not a problem as i didnt mind getting up and stretching. THIS SEAT WAS TERRIBLY UNCOMFORTABLE AS WAS THE ECONOMY SEAT ON MY RETURN FLIGHT.WOULD NOT TRAVEL AGAIN IN THIS PLANE UNLESS I COULD TRAVEL IN PREMIUM ECONOMY. CONSTANT QUEUES FOR THE TOILETS AND NOT VERY GOOD SERVICE ON THIS FLIGHT EITHER WAY. I flew on this plane on three different economy flights, during a recent USA holiday. The seats and aisles were quite narrow. The foot rest was good, providing it was propped up a bit (i.e. I put my bag under the seat in front of me and then pushed the foot rest down on top of it, otherwise it was too low for my short legs). The little section for charging and storing electronic equipment came in very handy. The dimmer for the windows didn't go low enough, and still let in light when at the lowest setting. I much prefer the old fashioned shutters. There are not as many toilets on this plane as others (two at the back and two in the middle), but I only found this to be a problem once, towards the end of a flight. Other than that one time, I generally just tried to go to the toilet when a toilet was vacant or the queues were short, even if I didn't really need to go. We sat behind the wing, so it seemed a bit noisier than where we usual choose to sit (which is towards the front of the plane or above the wing). Noise cancelling earphones came in very handy. When sitting in seats J and K, there is no seat leg/frame separating the two seats in front of you, so there is a bit more room to store items (or your feet) under the seat in front. These seats also have standard overhead storage bins. The special menus, lighting, pressure and humidity didn't seem to help with reducing my jet lag. I got back 9 days ago and am still suffering from it. Overall, I can't say anything stood out as being special - it was just as uncomfortable as any other long flight! (the perils of economy). The seat is nice and new and reasonably comfortable. However it is not as good as the 380 Premium Economy seat feeling noticeably smaller. It has a ridiculously large AirBag attached to the lap belt which makes it impossible to strapped in and eat your meal as it bumps into the table. It also feels very stiff and unyeilding if you leave it done up when you try and sleep. However all that said I slept well on the 17hr hop and enjoyed two movies on the really good 13" TV screen. The food was average for Premium, and the service was good. Rows 57-59 DEF do not have overhead bins due to the crew rest above. This is not a good seat. It doesnt have a window so is very claustrophobic and a bit narrower than the window seats. The toilet also opens into the aisle opposite this row. Avoid! It's possible that there is slightly less recline (~1-2 inch) in this seat, but the seat still satisfactorily reclines. Biggest negatives of this seat are (1) it's right behind the toilet wall and the flush is extremely loud, and (2) the light from the rear galley is very bright and fully illuminates at least the last 4 rows. The biggest advantage of this seat is the large floor area between the seat and the window - great for placing bags or just stretching out. I travelled on new Dreamliner for first time and was in premium economy. Seats in premium economy not as good as 380. A window seat has no luggage box and limited space for personal items. No real separation between classes and those at back of premium economy might as well be in economy with a thin wall and curtain the only separation. With no way to exclude light, my dimmer did not work very well and literally had to hold a paper to window to block out early morning sun. PE passengers have to use economy toilets and for the price, this is not a good. One final point is that if you are in PE and try for an upgrade , with something like 32 less First C and B Class seats versus the 380, good luck. In recline sleep mode kept waking up with sore backside syndrome. Otherwise a good seat. Had to use economy toilets which always had long queues. The economy seats were extremely narrow. Airlines have now got around not being able to charge by wt by having seats that only fit small economy passengers. There is no limited recline on these last row seats. They have the full 6 inches of recline as per every other seat. Fantastic seat! Great wing view and you could not hear much from the other sections. Very comfortable Premium economy seat. Great lumbar support and adjustable footrest. Plenty of charging points. Storage for small items on the seat back and in the arm rests. Qantas flies 1 versions of Boeing 787-9.